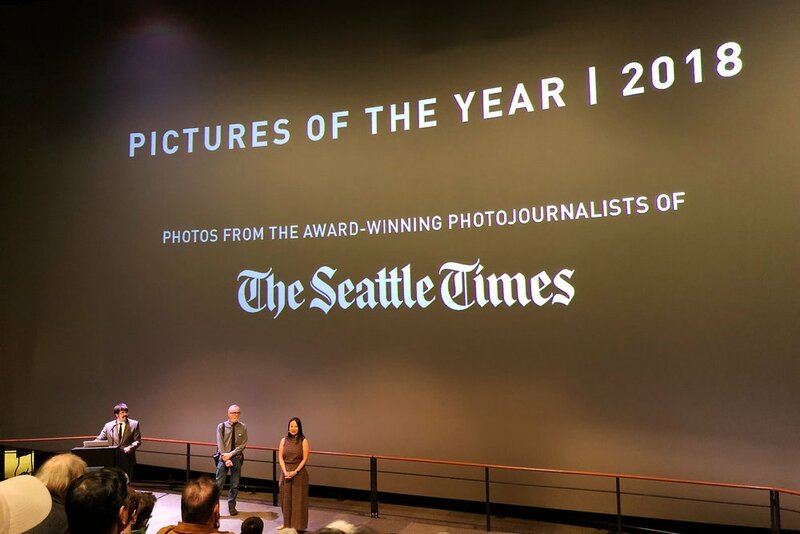 All the previous Pictures of the Year event were in the Central Branch of the Seattle Public Library, but this year they switched to one of the IMAX theaters at the Pacific Science Center. The number of seats didn't seem very different, but because the theater was designed for movies rather than presentations, the view of the screen and speakers was much better. The only downside is for some reason the projector was a tad out of focus, so the image wasn't as sharp as it could have been. Having images be 35 by 60 feet made it easy to ignore the focus problem. Because of the new venue, there was a ticketing system in place. At the library, we just queued up (a few minutes earlier each year), and we were able to get essentially the same seats each time. This year the invitation said that tickets would be available at 6pm and that the doors would open at 6:30. We swung by a bit before 5:30 and there was only one person waiting in line. After wandering around a bit, there were about a dozen people in line, so we decided to join it. The weather was a bit chilly, but not too bad. Even though the announcement mentioned tickets, everything seemed to indicate the line would be for going in at 6:30. Eventually, a woman walked down the line giving people hand stamps; she said they were going to let 200 people in so the stamps would guarantee us a spot. We decided to go back to the Armory to warm up a bit. Once we got back to the Science Center, there were about 50 people in line (the one person was still in front). Right at 6:30 the gate opened so we could walk across to the theater. There was the usual table with tote bags and postcards; I picked up one of the latter to send to Kellen and Noël (we'll see how long it takes me to actually do that). There were already quite a few people seated, but we found spots about halfway up and halfway to the side. We ended up sitting behind one current and one former Seattle Times photographer, and next to one of their videographers (and I was able to spot others within a few seats of us). What was interesting was watching one of them take photos with her phone during the event; just like the professional she is, she wouldn't take just one, but 4 or 5 shots at a time. As usual, Assistant Managing Editor Danny Gawlowski opened the event by welcoming everyone and starting the slide show of the pictures of the year. He then introduced Alan Berner, the first presenter. He's been with the Times for a couple decades and seems to cover lots of different events. I happened to see him covering the new 520 bridge opening ceremonies. His photos covered a pretty wide range, including one in a plane of one of the paper's interns. Corinne Chin has been with the times for about four years. having worked for the Associated Press. 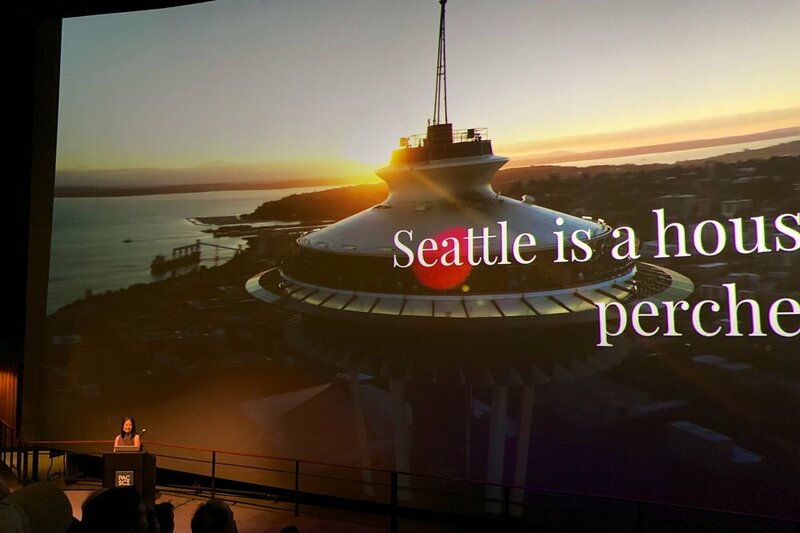 Her presentation included three stories for which she did videos: the Seattle Storm winning the championship, a family who decided to go with the father as he was being deported, and mother/daughter weightlifters. Afterward, Gawlowski, Berner, and Chin answered questions from the audience. Usually, there are several questions about equipment, but this year there was one (Berner replied that his switch to digital was that he was given a camera, someone went over it with him for a few hours, and he went out and started shooting). The rest of the questions were more about the reporting part of the job, such as how do you get people comfortable enough to talk with you. One youngster asked if people give permission before having photos taken of them, and Berner said that for the most part, it depends on the situation. For developing stories or things that just catch his eye, he'll take the photo and then go up to the person to get information. He did point out, however, that he always tries to engage with homeless people before taking photos. He'll use a wide-angle lens (from what I can tell, a lot of his shot are wide) and get close up to the subject, rather than taking shots with a long lens and at a great distance. Chin fielded a question about how long some stories take. Like everything else, it depends. There are some videos where they shoot a lot of footage then edit afterward. Others, they have an idea of what they want to do first and then shoot; sometimes the story evolves and they try to follow where it leads. People cleared out pretty quickly after the event, another side-effect of having it in a theater that's meant to have a quick turnover between screenings. I'm guessing they're going to try to have next year's event at the IMAX theater since there were really no bad seats.